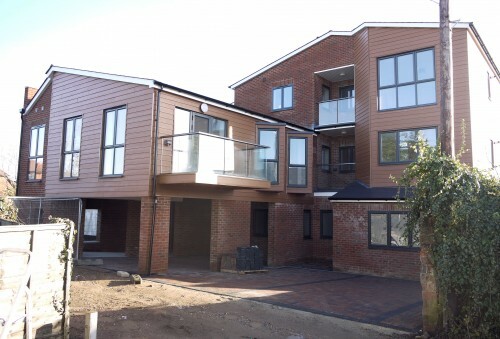 A first floor executive apartment in a development of four. Situated within a short walk of the station and town centre. The apartment has been built to a high specification and thoughtfully designed with modern day living very much in mind. There is a spacious open plan lounge/kitchen/dining room. The kitchen is fitted with a built in electric oven and hob, extractor hood and washer/dryer. There is direct access from the living area onto a balcony for al fresco summer dining. The bedrooms have fitted double wardrobes. The bathroom being fully tiled with a shower attachment over the bath, hand basin fitted into a modern vanity unit and useful ladder radiator. The living area has oak laminated flooring with the bedrooms and hallway having newly fitted carpets. The apartment is bright and airy and decorated in neutral colours throughout with complementing curtains/blinds in each room. Outside there is allocated parking for one vehicle and secure bike storage. There is a reservation fee of �500 once all the necessary references have been accepted by the landlord. This will be taken into account and deducted from the balance of the monies payabe (i.e. rent) 24 hours before you move in. There is a fee of �120 including for drawing up the Assured Shorthold Tenancy Agreement and a fee of �180 including vat for drawing up the inventory. Copies of both will be handed to you once you have signed the forms. The property is to let for one year (renewable) under an Assured Shorthold Tenancy Agreement. The tenants are liable for the cost of the preparation of the Assured SHorthold Tenancy Agreement and the preparation of the Inventory and Schedule of Condition. The first months rent is to be accompanied by a deposit of 1 1/2 months of the agreed rent and this is held until the end of the tenancy with the Deposit Protection Service. DIRECTIONS: From the agent`s offices in Normandy Street turn immediately left into Victoria Road. Take the first turning right (service road) and travel towards the end. The apartments are on the right hand side. DISCLAIMER: Whilst these particulars are deemed to be correct their accuracy cannot be guaranteed nor do they constitute an offer of contract.